MVP was established on the simple and humbling idea that life is short, time is scarce, the world is big, and connection is key. Life Is Short. Time Is Scarce. Yes, it's as corny as it gets, but it's true. We only have so much time on here to jam-pack in as many experiences, relationships, and memories as possible. Anything can change at the drop of the hat and the tomorrow we're waiting for may never come. This is especially true when it comes to the amount of time families get to spend together. You only get 18 summers with kids to make the memories to last you a lifetime - How Many Do You Have Left? It's not uncommon for us as Americans to get stuck in our own bubble. Yes, our country has a lot to offer but don't forget that there is a whole world out there with different people, foods, celebrations, values, and ways of life. As Americans we have a responsibility to become humble, to learn from others, and to share our ways of life with them. This attitude not only helps us expand into more respectful and tolerant individuals, but it gives us the contrast that is needed to appreciate all of the things that make our home country amazing. There is a power in coming together to share a new experience. To meet others from around the world through a shared interest and realize that they're not so different from us after all. Take the opportunity to connect through something you love and share it with those you care about. It's About The People Along The Way. Here are 2 great resources that share this mentality. Coach Pudge is known by both the Virginia High School Baseball community as well as the national baseball community for bringing a high level of energy, charisma, and absolute passion to the field, every single day. With decades of accomplishments, 2 State Championships, coach Pudge is currently the 4th winningest baseball coach in Virginia High School Baseball history with nearly 400 wins. Coach Pudge’s story starts back in 2008. After much hesitation and some convincing by his supportive wife, Beth, Coach Pudge got his first taste of international baseball on a trip to Germany with some of the top players in the DMV area. After having his eyes opened to the impact the game of baseball was having around the world, he was all-in. After a few more trips it was back to the drawing board as to how he could share an experience that was transforming not only his life, but also those of hundreds of athletes and families that were joining him on the trips. He had a vision to reach the lives of thousands across a variety of sports with these unforgettable trips. In 2012, coach Pudge contacted now business partner, Matt Foley to help this dream come to reality. While coach Pudge handled the sports side of things, Matt handled the business side, and the partnership was formed. Since then, coach Pudge has continued to share his vision that he founded the company with and also directs all things related to baseball. Since then, coach Pudge has continued to lead hundreds of travelers every summer and claims that this thing is justgetting started! Matt played for coach Pudge, graduating in 2003 and racking up a laundry list of awards, both in the JMHS record books as well as at the state level. After 4 successful years, 2 regional championships and a state championship at Madison, Matt went on to catch at Virginia Tech for 4 years. After a few years in the corporate world, Matt was drawn back to the game as a coach as he enjoyed staying connected to the baseball community. When he was approached by coach Pudge in 2012 to form what is now MVP International Athletics, he saw it as an opportunity to further apply what he had learned in the corporate world in order to build something very special. Since then, Matt has served as President of MVP International and oversees the smooth running of the business operation. Matt also has a focus in the real estate field and currently resides in Arlington, VA with his wife Meghan and 2 kids, Bryce (3) Blake (1). Eli’s background in international sports tours goes back to 2009. After going on back-to-back undefeated trips to the Dominican Republic and Italy under coach Pudge, the bug had bit Eli and he was hooked. Eli went on to play Division I baseball at Lehigh University. While there he majored in Finance with a minor in Spanish, and was also afforded the opportunity to do a semester abroad in Barcelona, Spain. It was during that semester abroad that he re-connected with the MVP International team and slowly began to support the organization. Eli continued to work for MVP International part time as a senior at Lehigh University and became MVP International’s first full-time employee upon graduation in 2015. Since then Eli has taken over the role of running the day to day operation of the business. Eli also serves as the group leader for several MVP International tours. Originally from NY, Bob worked at James Madison High School in Vienna, VA as a Counselor for 30 years. One of the things Bob enjoyed most was the sense of community and caring that Vienna and Madison bring. This is the same sense of community that the MVP team likes to create for its travelers. Bob first got the travel bug in his early 20’s when he visited Italy and fell in love with that country, having gone back a number of times since. He has have visited numerous countries since then, and gets excited when seeing how positively the “travel bug” affects his traveling companions. Bob bring that same enthusiasm to MVP International and is an absolute fireplug to the team. Bob supports customers with account needs amongst other things and provides an extremely cool head on any trip having dealt with many challenging circumstances in his 30 years as a Counselor! The MVP team welcomes Bob and is excited to share lasting memories with him. Having joined MVP International as a traveler many times in the past, O’Kelly brings a perspective that is highly valued by the MVP International Athletics team and organization. O’Kelly advises US and international clients on a wide range of business and employment law matters. He has extensive experience handling employment aspects of M&A and other corporate transactions as well as employment disputes and compensation issues. O’Kelly has collaborated with some of the world’s leading companies and emerging businesses to mitigate their risks and advance their business plans. He also serves on the Board of Trustees for the Virginia Retirement System — a nearly $80 billion pension plan — and participates on its Benefits & Actuarial, Audit and Compliance, Defined Contribution Plan, and Administration and Personnel committees. Samantha began interning with the MVP International team in the Spring of 2018. Samantha is currently a sophomore at James Madison University where she is also the Manager of the Dukes Baseball team. Samantha brings a unique perspective to the team as she has gone on these trips as a player, sibling, and a staff member. Samantha is passionate about sports media and enjoys creating exposure for players and teams. Her role with the MVP team is quite versatile as she helps with daily needs ranging anywhere from administrative support, to social media, or even to helping out with the team apparel. as well as help them create memories and friendships that would last a lifetime. 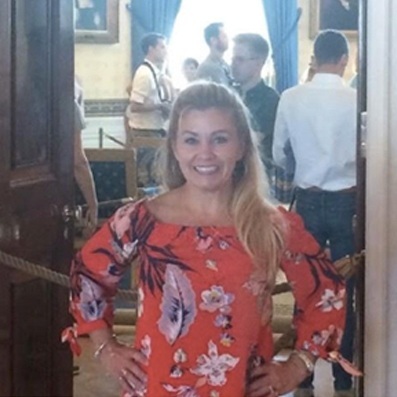 As a US Military Family Tonya was afforded the opportunity of being stationed in several areas throughout the United States as well as overseas. She had the pleasure of being stationed in Italy for 3 years with her Bob and two children, Makayla and Noah. They lived in Vicenza which is about an hour west of Venice. While stationed in Italy, the family traveled throughout Europe and cruised the Mediterranean on several occasions. They never returned to the US until their three year military assignment was complete because Europe had so much to see and they wanted to take full advantage! A few years later after returning to Virginia, Tonya and her family joined MVP International on the 2017 Germany baseball tour and had a blast! It was then that the MVP team realized she would be a great part of the equation. Tonya absolutely loves to travel, meet new friends and to help others achieve their dreams...For all of these reasons and more, Tonya is an absolute perfect fit for the team! Coach Roberts also grew up in various places around the world and brings a cultural tone to the program that is highly valued by the MVP team. Coach Roberts led his first tour with MVP International in 2018 to Central Europe with a group of 16u players and families. With the amazing experience gained, Coach Roberts has ambitiously contributed to bring new opportunities to the Ice Hockey community at large. Coach Roberts resides in Reston, VA with his wife Marie and his infant, Colin. Coach Stu Vetter brings decades of experience coaching, inspiring, and mentoring high school men’s basketball players at the highest level in the country. Coach Vetter has been coaching for over 40 years. Few Coaches have ever been able to bring such a passion for the game to so many. In addition to graduating over 100 players who have become Division 1 student/athletes, nine of Coach Vetter’s players have gone on to play in the NBA. And more still have continued as coaches at the High School and College level. Coach Vetter attends and takes a very hands on approach and will be ensuring that all men’s basketball players are ready for the task to represent the USA internationally. Having coached internationally several times, Coach Vetter knows exactly what it takes to represent the USA on the international stage. He brings a passion for connecting the world through basketball and has seen this impact personally as he has had a number of international players on his team over the years.